Frank C Bostock is not a name you’d probably immediately recognise but his grave monument gives a big clue to his profession. Born in 1866 into a family that ran a travelling menagerie (his grandfather was the famous George Wombwell who is buried at Highgate Cemetery), Frank, who became a lion tamer while still a teenager, initially worked as part of the family operation. In his late 20s, however, he travelled to the US where he established his own menagerie in New York initially in Brooklyn and later at Coney Island. He later returned to the UK and there set up a massive touring exhibition, known as the Jungle, that travelled from city to city. Bostock died, ostensibly from the flu, on 8th October, 1912. He was buried at Abney Park Cemetery in Stoke Newington in what was by all accounts a grand affair. 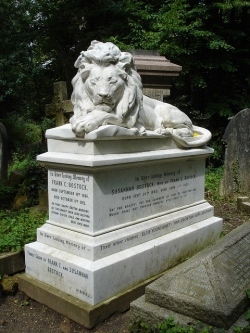 The Grade II-listed rectangular white marble grave cover, made by Millward and Co, is topped with a carved figure of a sleeping lion. There’s said to be a couple of traditions associated with the grave – one says people stroke the lion’s left paw for luck, the other says people place flowers under the lion’s paws for the same. WHERE: Highgate East Cemetery, Swain’s Lane (nearest Tube station is Archway); WHEN: 10am to 5pm daily; COST: £4 adults/children under 18 and members free; WEBSITE: highgatecemetery.org/visit/cemetery/east. PICTURE: Taken in July, 2011. Julian Walker (licensed under CC BY-NC-ND 2.0).